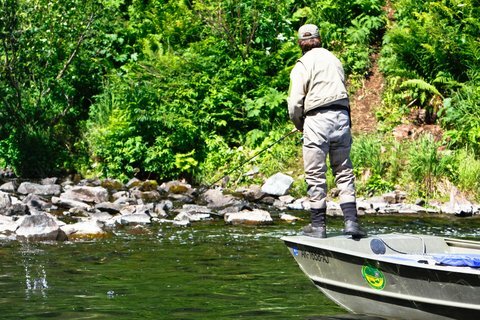 To some, this step in the process may seem like a no-brainer, but if you make a mistake while fighting a fish you’re likely to lose it or break off your line. In order to keep your odds of bringing a fish into the boat high, here are three tips to keep in mind. Once you set the hook and have a big bass on your line, your rod serves as a point of leverage, shock absorber and guide to bring the fish to the boat. The biggest mistake many anglers make here is keeping their fishing rod from doing its job. It’s easy to rush the process, but you’ll land more fish by keeping steady pressure and letting your rod’s action tire the fish out. Keeping steady pressure also prevents slack from forming when a hooked fish jumps and shakes its head—which is one of the main reasons anglers lose a fish. Slack in your line is your worst enemy when you’re fighting a fish. Even poorly hooked fish usually make it to the boat as long as there is no slack. If you’ve ever caught a fish and had it come off in the net or pop loose as soon as it lands in the boat, odds are this is exactly what why. The fish wasn’t securely hooked and thus popped loose as soon as it got slack from the net or boat carpet. Jerking with the fishing rod is one of the quickest ways to create slack to the line while you’re fighting a big bass. Fight the urge to do this and you’ll be in good shape to prevent slack in your line. If you’ve ever watched enough fishing shows or tournaments, then you’ve inevitably seen countless professional anglers lift their hooked bass into the bottom of their boat. Sure, it looks cool and can be effective sometimes, but it’s also another chance for a bass to come off, particularly if it’s a big one. Many proud anglers refuse to use a net, but a landing net greatly decreases lost fish by expanding your reach. Nets are particularly effective when fishing baits with treble hooks, as they go a long way towards reducing the risk of hooking yourself.